Accurate indication while used with D 100. 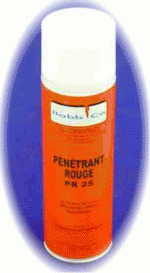 PR 25 - classic red penetrant, having medium properties. Used with developer R 60. 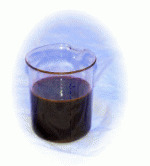 Is characterized by medium resistance to the rinsing and to the intensive washing. Ideal colorimetric detection, gives two colors. Violet-red penetrant of 1st sensitivity level. Used for the non-destructive testing not requiring any use of penetrant of 2nd sensitivity level. Penetrant B 305 is notable for high penetration power at low temperatures. However, if there is a probability of ice presence in irregularities of the object under examination, it is advisable do not conduct the non-destructive testing. During the coating process this penetrant has no color or is a little colored. The penetrant gains on color during the examination. The surplus of penetrant is evacuated with rags, wetted in N 120 (the use of N106 A is inadmissible). Is used with developer R62. Product, having exclusive properties. Gives three different colors, Combines such properties like uncommon resistance to rinsing, sensitivity of type II, very low noise background. Effluents are suitable for the treatment with carbon. Significant reduction in the duration of washing and in the volume of liquid waste.